D. Raja, National Secretary, Communist Party of India, addressing concluding session of a national consultation on Budget Justice — Agenda for the Next Five Years in New Delhi. New Delhi, September 19: D. Raja, National Secretary, Communist Party of India, has said that in the preparation of Union Budget the pre-budget consultation before its presentation in Parliament has become a ritual. The voices of various sectors of civil society are rarely heard while the corporate sector has its say all the way capturing lion’s share. Thus, the final outcome of the budget that is presented often becomes Corporate-centric. 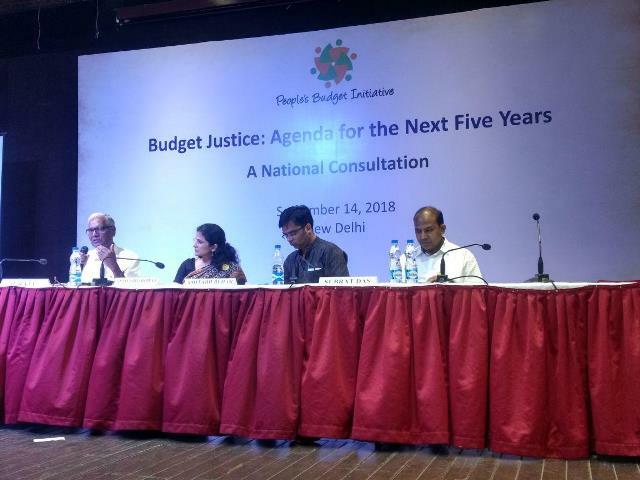 Raja made these remarks while speaking as chief guest in the concluding session of day-long national consultation on “Budget Justice: Agenda for the Next Five Years” which was organized here on September 14, 2018 under the aegis of the People’s Budget Initiative, (PBI). The session was chaired by Amitabh Behar of PBI/Wada Na Todo Abhiyan. 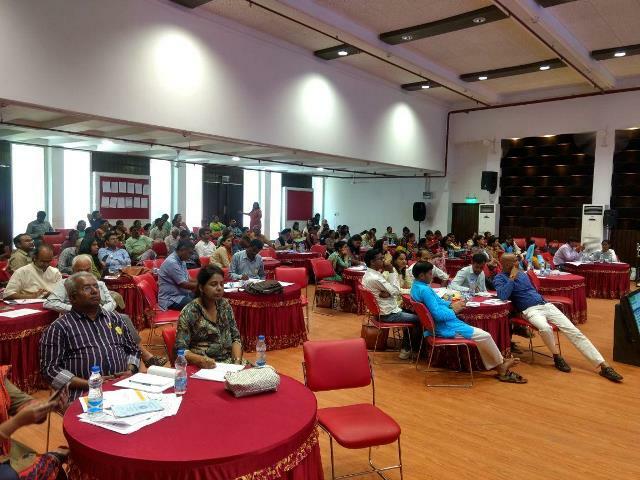 It may be noted here that the PBI is a coalition of civil society organisations from across the country which promotes people’s voice in policy making processes related to government budgets in India. The national consultation was a part of its campaign on ‘Budget Justice for Disadvantaged Sections’. As the country is gearing up for the upcoming general elections both at the Centre and in a few States in 2019, efforts are being made by PBI to capture people’s budget related expectations from the new governments. In this regard, State Consultations on ‘People’s Expectations on Budgetary Priorities’ were held in Assam, Andhra Pradesh, Jharkhand, Maharashtra, Rajasthan and Uttar Pradesh. The National Consultation brought together civil society coalitions, grassroots level organisations, budget groups and leaders of people’s movements from across the country for consolidating the demands emerging at the state consultations. Continuing Raja lamented that the “Revenue Foregone”, which is the amount reflecting the loss to the government on account of tax cuts offered to the Corporate, is huge. This amount can be used to finance essential services like Education and Health, which should be free to People, he added. It may be pointed out here that tax expenditures or the revenue forgone are sanctioned in the tax laws. A statement of the same, (as far as Federal/Union/Central Government is concerned) is presented to the Parliament at the time of Union Budget by way of a separate budget document titled “Statement of Revenue Foregone”. Raja said that neo-liberal economic policies adopted by India since the 1990s has resulted to broaden the gap between the poor and the rich. This fact has been corroborated by the IMF (International Monetary Fund) which has admitted that the neo-liberal economic policies have not only widened further the economic disparity between countries but also within the country, he pointed out. He said the present government at the Centre is not people’s government as it was elected by just 31 per cent votes. As such, Abraham Lincoln’s well-known quote: “Government of the people, by the people, for the people, shall not perish from the Earth” does not apply at the present dispensation. The anti-people policies of the NDA Government will spell its doom. Meanwhile, the theme of the inaugural session was “The Governance Agenda for the Next Five Years from the Lens of Equity and Social Justice”. Anjali Bhardwaj and Subrat Das, Co-convenors of PBI, introduced the topic while Bezwada Wilson (Safai Karmachari Andolan) delivered the keynote address in the session. Bezwada Wilson in his address said that all Indians are tax payers and equal in political sphere. He, however, lamented that though the country gained freedom in 1947 but the common man by and large is still a slave as the fruits of freedom have not reached him. He continues to be ravaged by poverty, illiteracy, poor health conditions etc. Wilson moaned that the preamble of the Indian Constitution is not being followed while preparing Union or state budgets. The preamble clearly states to secure to all its citizens Justice, Liberty, Equality and Fraternity. Justice which entails social, economic and political aspect is missing out as we have not been able to implement even the Constitution’s preamble by building an equal society. According to a report, he said, one per cent people of the country have grabbed the 73 per cent wealth of India. It should have been equal opportunity for all to access the wealth of the country. The economic policy of the country, however, is not right and there is total devastation due to political system in the country, he added. Speaking on the occasion Subrat Das, Executive Director, Centre for Budget and Governance Accountability, (CBGA), said that Budget is a political issue, not a technical issue, and therefore the process of budget making should be inward having people at its centre. He pointed out that unless locally relevant budget information is made available in public domain in a timely manner, people can’t engage with budget issues. A tokenistic participation in this important process doesn’t lead to anything, it is people’s right to have a meaningful participation at every level. While Anjali Bhardwaj, Co-Convenor, National Campaign for People’s Right to Information (NCPRI), said that efforts and acts towards directed at diluting the accountability institutions needs to be squarely addressed. The issues discussed will feed into the ‘People’s Agenda’ for the next five years to be developed by PBI. The discussion also noted that the big tax reforms initiated recently hurt the unorganised sector. Members discussed the need for greater reliance on direct taxes for mobilisation of resources by the government. In the coming months, PBI will campaign to advocate for progressive changes in policies and budgets that address inequalities faced by disadvantaged sections of population. Meanwhile, apart from the inaugural and concluding session there were three plenary sessions. After the inauguration session a session was held on the topic “Challenges in Accessing Public Services: Voices from the Communities”. The session was chaired by Sachin Jain (Vikas Samvad, Madhya Pradesh). In this session panellists were Amit Tripathi (Youth Policy Advocacy Network, Uttar Pradesh); Chandrakala Sharma (Ekal Nari Shakti Sangathan, Rajasthan); Dhrubo Jyoti (Journalist and LGBTQ Activist); Mithilesh Kumar (NREGA Watch, Jharkhand); Pushpa Latha and Amrita Johri (Satark Nagrik Sangathan / NCPRI); Saira Begum (Bharatiya Muslim Mahila Andolan, West Bengal); Usha Rani (All India Federation of Anganwadi Workers and Helpers, Punjab). The second session was on the topic of “Issues and Priorities Emerging from the PBI State Consultations” which was chaired by Subrat Das of People’s Budget Initiative who is also Executive Director CBGA. The panellists in the session included: Hilda Grace (People’s Monitoring Committee, Andhra Pradesh); Monisha Behal (North East Network, Assam); Nesar Ahmad (Budget Analysis Resource Centre, Rajasthan); Sangeeta Maurya (Sahayog / Health Watch, Uttar Pradesh); Sunil Minj (National Campaign on Dalit Human Rights, Jharkhand); Trupti Joshi (SATHI/ Jaganyacha Hakkache Andolan – Movement for Right to Live, Maharashtra). While the third session of the day was titled “Priorities and Demands of National Campaigns / Movements on Budget Justice”. The session was chaired by Prof. Praveen Jha of Jawaharlal Nehru University. In this session speakers were Ambarish Rai (Right to Education Forum); Ms Beena Pallical (National Campaign on Dalit Human Rights); Chandan Kumar (Working People’s Charter); Dipa Sinha (Right to Food Campaign); Ravi Duggal (Jan Swasthya Abhiyan); Soma K. P. (Mahila Kisan Adhikaar Manch – MAKAAM); Venkatesh Nayak (National Campaign for Peoples’ Right to; Information); Ms Zakia Soman (Bharatiya Muslim Mahila Andolan).